The price of crude increased by $11 overnight. Dow Jones Industrial Average dropped 400 points. Gasoline is over $4/gallon in US. In India, the price of gasoline and diesel went up by about 10%. A while back, someone in US bought a Toyota Prius hybrid and added lots of batteries and made it pluggable. It could be charged overnight in the garage using standard power outlet. All local travel such as commuting to the office, store etc. can now be battery powered. The gas tank becomes the backup. It is more than 10 years since Toyota introduced the Prius and yet the company (nor the mainstream competition) sells pluggable cars. I think, however, that we need a better slogan as “100+ MPG” can be misleading. 100+ MPG can let some one conclude that the gasoline engine is now 300% more efficient. This is not true as we are talking about a standard engine that gives around 25 MPG. For short trips (say under 30 to 60 miles), no gasoline is consumed at all and so MPG is not relevant. Charging stations (instead of gas stations) that provide a fast charge can make even longer trips possible using electricity alone. Miles per dollar or MPD may be a better benchmark than MPG. Currently, when gasoline is $4/gallon, for a standard vehicle that gets 25 MPG, we can say that it gives 6 miles/dollar or 6 MPD. According to Goldman Sachs we can soon be paying $7 per gallon which means you will get less than 4 MPD. 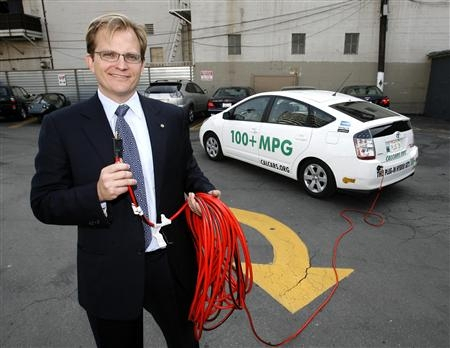 With PHEV, when using only electricity, depending upon the cost of electricity, we can get 12 MPD or even 20 MPD. Over the next decade construct lots of nuclear power plants that can provide power to pluggable vehicles. In the meantime locally available sources of power (like hydro, coal, wind) etc can be used. This will dramatically reduce the demand for crude — though aviation will still require petroleum. The additional benefit of plugin vehicles is that you have zero emissions where the vehicle is driven (you can still have emissions at the source, if energy sources such as coal are used to generate electricty): a win-win situation. With gasoline at over 4$ a gallon, I hope Obama and McCain (and leaders of other countries) give a lot of importance/subsidies/tax-breaks so that PHEV doesn’t remain just in the tinkerer’s garage or environmentalist’s garage but is available to everyone . I want the next automobile I buy to be a PHEV. And if the solar panels on the roof of the house can partially offset the cost of electricity required to charge the PHEV, that’s even better. And on a selfish note, when price of crude comes down due to decreased demand, not only will flying by commercial airliners become more affordable, it will make general aviation and Soaring more affordable. 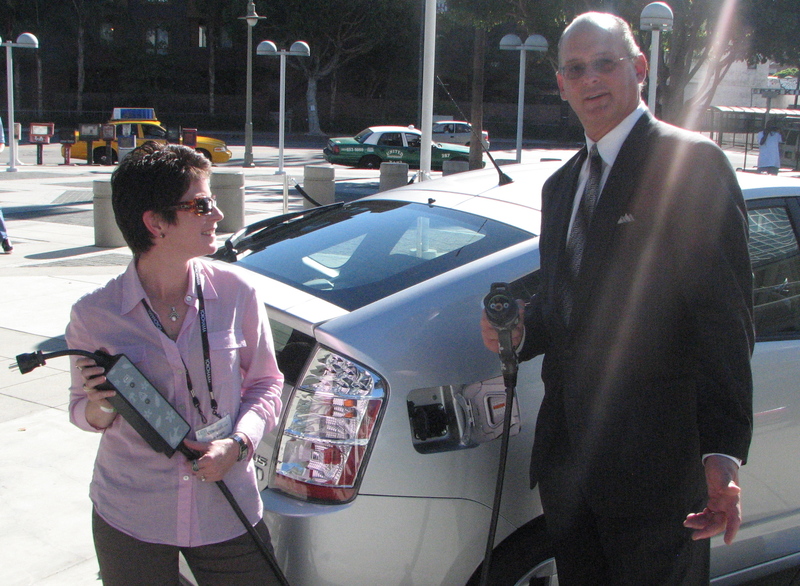 Toyota USA spokeswoman Cindy Knight and VP of Communications Irv Miller with a Prius converted by the company to a PHEV, at the LA Auto Show, November 2007. All you need to do is to plug it in! The picture shows calcars’s PHEV. Previous Post Accused 9/11 mastermind asks judge to be executed!